BMW M5 | Welcome to the RW Carbon Blog! Today, in this edition of the RW Carbon’s Buyer’s Guide for CF aero parts we go over options for your BMW F10 M5. The BMW F10 M5 was introduced in 2012, just a couple years after the release of the new BMW F10 5 series. This generation M5 was a huge leap in performance and technological advancement from the previous M5 generation. 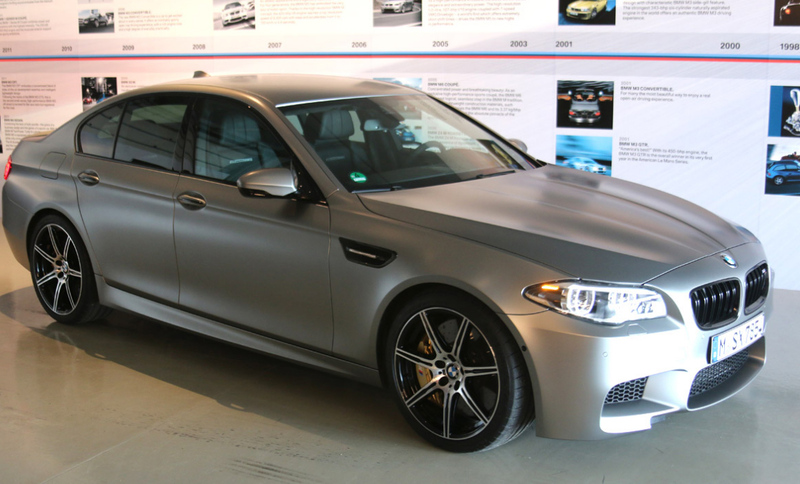 This was the first M5 to use a V-8 twin turbo power plant that produced over 560HP. Due to the popularity of the BMW F10 M5, there became a huge demand for aftermarket products like carbon fiber. This lead to a huge array of carbon fiber products for the new M5 models. In this buyer’s guide article I want to go over some of the CF choices RW Carbon carries and hopefully in turn help you decide what product(s) are best for your build. RW Carbon chooses to re-make the most appealing and popular designs to already help you with your decision. If you want to learn more about any of the products you see below just click the picture to be taken to our website. The first categories of products we can go over are carbon fiber front lip spoilers and/or splitters. When it comes to large CF products, a front lip or a set of splitters is typically the first item a customer wants to add. The front end of your car is the first aspect people will check out and so it needs to have a more aggressive manor in order to be noticed out of a crowd of high end sports cars. RW Carbon carries 2 popular front lip designs and 1 style of splitters. The first front lip is the RKP style or center carbon fiber front lip spoiler. This piece is small and modest, but gives your F10 M5 a great updated appearance with some contrast added to the front. This lip does not dip below the front bumper, which makes it a hit for M5 owners looking to lower their M5. It attaches using self taping screws and because of the size is a fairly simple and quick install. If the RKP style does not cut if for you, then we also have the more aggressive 3D style carbon fiber front lip. This is more of a typical 1 piece full front lip that extends below the front bumper and covers the splitter sections for the most aggressive look possible. This ones installation is more complicated using a combination of self taping screws and 3M double sided tape. Professional installation is highly recommended. A carbon fiber splitter option is more of a middle ground for the M5. They are more aggressive feeling than the RKP style lip, but is more lowered friendly and easier to install than the 3D style lip. All 3 options are made using real 2×2 carbon fiber fabric and are clear coated for a brilliant shine and protection from the elements. Moving onto our next CF category, we have diffusers. Typically our customers second choice, as it can drastically change the look and feel of your M5. Because the F10 M5 has such a large diffuser area this one part can be a huge upgrade. RW Carbon carries 3 options for diffusers (2 options shown below) and although they are similar, they can give your M5 a different feel. The DTM diffuser tends to give a more aggressive and racey touch then the 3D Style. The DTM and 3D Style Diffusers install the exact same way. Due to the large nature of these pieces the rear bumper MUST be removed so professional installation if highly recommended. Once the bumper is off the car the diffuser can be applied to the bumper via clips and screws. Both are made from the same 2×2 carbon fiber fabric material and comes with RW Carbon’s fitment and quality guarantee. When it comes to choosing a carbon fiber trunk spoiler for your BMW F10 M5, we carry 3 types. 2 of the 3 types will be described in this article. The Performance style trunk spoilers for the F10 models are by far the most popular. Due to this we give our customers an option on how they want their trunk spoiler built. The reasoning behind this is to offer trunk spoilers at different prices. The first one (seen below) is made of out fiberglass and then overlayed with real carbon fiber fabric. The second choice is made using a vacuum formed process. This eliminates the use of fiberglass and creates a 100% carbon fiber product. This spoiler will be lighter and will ultimately fit better due to the flex of the full carbon build. For more pictures of the 2 and price differences, please click on the links below. Front lips, diffuser and trunk spoilers tend to be the 3 most popular products for a CF themed build. However, if you are not satisfied we have several other CF parts and accessories that can take your M5 above and beyond. Items such as our carbon fiber roof spoiler, side skirt extensions, grilles, mirror caps and much more. If you are interested in more parts for your car then you see here please visit our online store at www.rwcarbon.com. If you want to check out the roof spoiler or side skirt extensions click on the link below. For any further questions or inquires please contact a RW Carbon Fiber specialist. They are standing by to help answer any questions you may have. Contact them by phone at (714) 328-4406 or email them at info@rwcarbon.com. And do not forget if you want to learn more about any of the products you see above please click on the pictures shown above. As some of the diehard enthusiasts already know BMW has released a special 30 year anniversary M5 dubbed the “Jahre” edition. Unique to this BMW M5 is a bumped power output to 600 horsepower (The most in any BMW ever). This M5 sports a unique matte grey finish and special emblems all over the vehicle. Recently BMW gave us something even more for us to drool over with a video of this unique M5 drifting. Check it out below! This M5 posts a 0-60 time of 3.7 seconds, but bring your wallet because there is a heft premium for this edition. With only 30 of the 300 being produced coming to the United States the starting price is $138,275. Already have an M5 but need some visual upgrades? Click here to view BMW F10 M5 upgrades!